It’s Australia Day today. 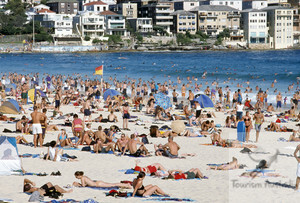 I’ve blogged about Australia Day before, here and here and here and here. I think I’ve said all that I can think of to say about Australia Day, especially as I feel rather ambivalent about the whole thing. 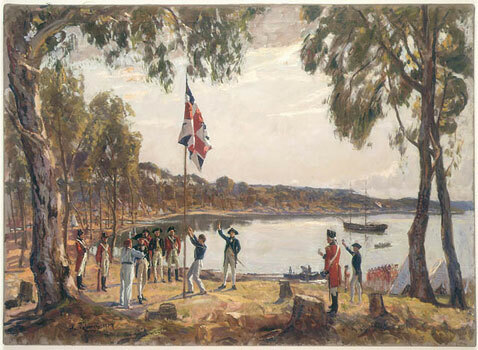 So today, I’ll take a different but related tack about Australian patriotism and its expression. 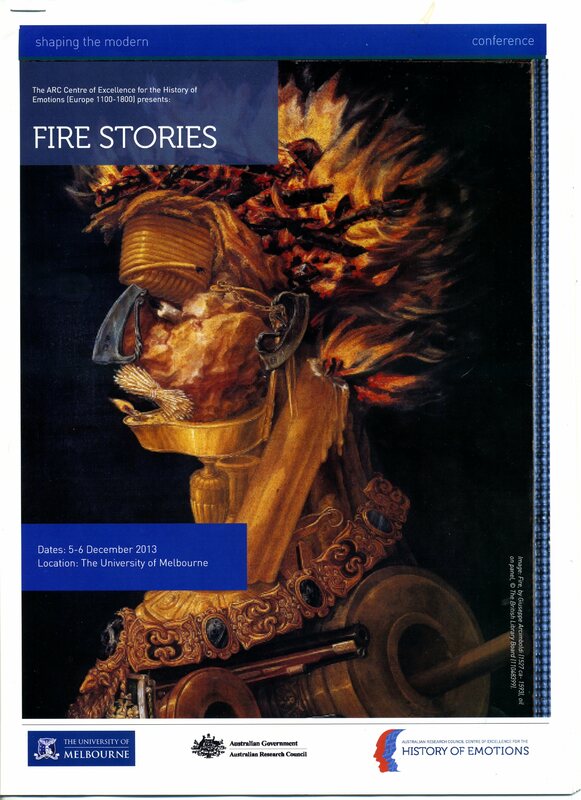 Some weeks ago I attended a seminar called ‘Fire Stories’ presented by the ARC Centre of Excellence for the History of the Emotions, held at the University of Melbourne. I intended blogging about it but found myself caught yet again between the desire to take time to reflect before putting fingers to keyboard, and the inexorable march of days rendering the whole post irrelevant and undermining my confidence that, after such a long time, I could render the presentation or my responses faithfully. So it remained a blog post unwritten. Functioning variously as guidance, warning and inspiration, the Beacon Fire may also be turned to ill use. Embodying fire’s paradoxical character, the beacon fire lends itself to multiple representations in text and image, the subject of this paper. From the lingering evocations of the Greek tragedian, Aeschylus, describing the progress of the beacon fires that carried news of the fall of Troy, to the thrilling spectacle provided by the film director Peter Jackson, who describes another type of ‘progress’ in his Lord of the Rings: The Return of the King , the beacon fire flares triumphantly. These grand scenarios are countered by the prosaically patriotic lighting of over 4000 beacons (around the globe) to celebrate the British Queen’s 60 years on the throne . 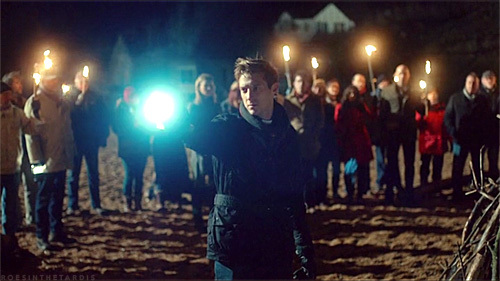 We were sitting watching the final scene of Broadchurch on television some months back- if you saw it, you’ll remember where the town assembled on the beach to light the first of a string of beacons around the bay to mark their support for Danny Latimer’s family. “What was that beacon I helped with again?” asked Dad. Beacon? What beacon? we said. It was up at La Trobe University (my university, very close by) during the 1980s, he said. A real schemozzle, apparently. We had no idea what he was talking about. Off to Google we went, as you do- and there it was, Australia’s very own “prosaically patriotic” Bicentennial Beacon Project. According to the IPA review (I can’t believe that I’m quoting this source), the Bicentennial Birthday Beacons project arose from “concern at the direction the Bicentennial was taking”. As the ‘Bicentenary Battles’ chapter in Stuart Macintyre and Anna Clark’s book The History Wars points out, Ken Baker’s rather snide and waspish comments above reflect a concern that he had expressed as early as 1985 that the bicentenary was turning into an apology rather than a celebration. 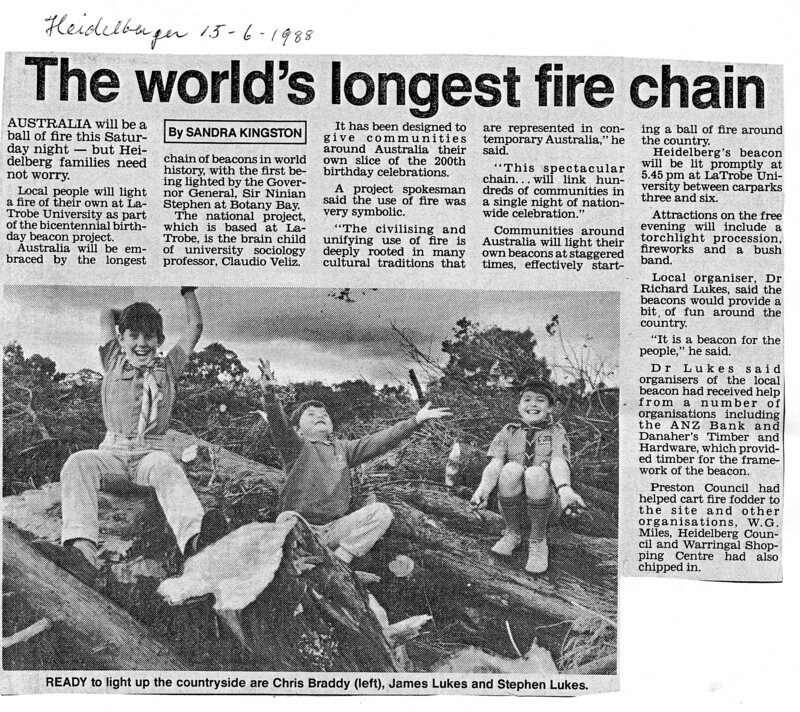 And so, headed by Claudio Velez from La Trobe University, the birthday beacon project was born, comprising 550 official sites around Australia on the night of 18-19th June 1988, with an estimated two million Australians taking part. None of this special interest stuff: this was something that ‘ordinary Australians’ could embrace and be part of. La Trobe University, as the administrative heart of the whole project, was to have its own beacon. So, what was my daddy’s involvement? Dad was Lumley’s Loaders, Lumley’s Constructions and Lumley’s Farm Machinery with a sizeable collection of low loaders, caterpillars, graders etc. based at Thornbury, just a few kilometres away from La Trobe University. He can’t recall just how he became involved- he remembers it as a phone-call (the extracts below notwithstanding)- because the Glen College site is not visible from public roads, and he was unlikely to see it just driving past. But what he does remember was that it was an “absolute schemozzle” in the pouring rain and that if he hadn’t brought along his heavy artillery, there was no way that the La Trobe beacon would have eventuated, let alone flared. There was a special incentive to build a beacon at La Trobe University, as Glenn College had been ‘home’ for “Birthday Beacons” since the beginning of the concept itself grew out of meetings held in the College. Initially it was thought that students of the College might prepare a simple beacons, and a talk by the Executive Officer, Wayne Jackson, on 13 April, provided further impetus. Then followed involvement of community groups, notably 1st and 3rd Rosanna Scouts and Rosanna Primary School, and the goals became more ambitious! Decision to provide entertainment meant that sponsorship became necessary and this was provided by local firms and Councils. Anxious attention to weather forecasts for days before the event was a waste of time! The day itself dawned clear and full of promise that the forecast of a fine evening would be borne out. How misplaced was such optimism. As a small band of people struggled with increasing weariness and legs which were beginning to object to climbing ladders (“…what, not again…!”), the clouds began to gather and the clock began to go even faster. Then [a] miracle occurred! A stranger who had been driving past and had stopped to help, quietly asked whether some heavier equipment would be of use. An unambiguous ‘yes’ from the builders was followed a little later, by the arrival of a low loader and Drott. Our ‘welcome stranger’ turned out to be a local earthmoving contractor! For the next couple of hours the unsightly pile got smaller, the bonfire got larger and our ‘saviour’ got wetter and wetter! As the rain got heavier and the ground got softer under foot, the organizers (along with many others in Victoria!) wondered whether anyone would brave the elements to see whether liberal applications of diesel would enable a bonfire to be lit in the pouring rain! By dusk the weather had cleared a little and the CFA brigades from Diamond Creek, Eltham and Epping were able to stage a most impressive torchlight procession. The large marquee, which was to have been the focus of bush-dancing was full of people trying to stay warm(ish) and dry. The unlit bonfire was surrounded by a large number of more adventurous people interested to see whether the torches borne by the shivering runners could, in the hands of two Mayors and the University’s Vice-Chancellor, find the ‘priming’ hidden under a mountain of sodden vegetation! The deep laid plans of the organizers…! Where were those air vents so cunningly constructed according to…instructions? Answer…buried under the material moved by the Drott! Communities around Australia will light their own beacons at staggered times, effectively starting a ball of fire around the country. Heidelberg’s beacon will be lit promptly at 5.45 at La Trobe University between carparks three and six. Attractions on the free evening will include a torchlight procession, fireworks and a bush band. Another article in the Heidelberger of 15 June noted that Rosanna Primary School children were selling commemorative programs for $3.00. The beacon would be lit by three torches to be handed to the mayors of Heidelberg (Cr. Hec Davis) and Preston (Cr. Gary Jungwirth), and the Vice Chancellor of La Trobe University Professor John Scott. The Heidelberger of the following week (22nd June) carried the rather anti-climactic news of the evening- with no pictures. More than 2000 had braved the cold, wet and windy weather, it reported. Costs were just covered by sponsorship, and some money was made from food sales. To add insult to injury, thieves stole a $500 chainsaw, owned by the university. Mr Braddy paid tribute to an anonymous man who had turned up with a front end loader to help build the beacon after seeing the organizers were having trouble. Trouble? A schemozzle, in Dad’s words. It puzzles me, actually, why I didn’t attend this. Did Dad even tell me about it at the time? I had a 4 year old and 2 year old who would have enjoyed it but perhaps the weather was just too daunting. In fact, I remember nothing about it at all, and it would have slipped from family memory completely had the sight of the Broadchurch beacons not triggered Dad’s recollection. We were going through old pictures and I found this one. Here it is! On the right you can see the ‘Celebration of a Nation’ van, with the marquee beside it. On the left you can see the bare bones of the beacon, with all the tree branches around it. And sure enough, it’s sunny then but those high clouds are a bit of worry. And yes, given that the beacon was about to be lit that night, there was quite a bit of work to be done!